Eggs Mimosa is with Tuna is a French version of deviled eggs, also known as Les Oeufs Mimosa Au Thon. 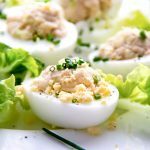 Egg are stuffed with a mustardy egg and tuna salad that’s spiked with scallions. These hearty, flavor-packed French deviled eggs make a fantastic brunch, lunch, appetizer or game day snack. I discovered eggs mimosa with tuna at a brasserie in Bordeaux, scribbled on the chalk menu board under “entrées” (starters). They arrived on an oblong plate, five generously-stuffed eggs lined up in a row staring up at my four friends and me. We were the kind of hungry you get when you’re traveling, when you’ve walked from one end of a city to the other before noticing that it’s considerably past your normal lunch hour. Les Oufs mimosa au thon were the most heavenly way to break our fast – deliciously substantial and satisfying… though I wasn’t actually satisfied until I made them myself a half dozen times. 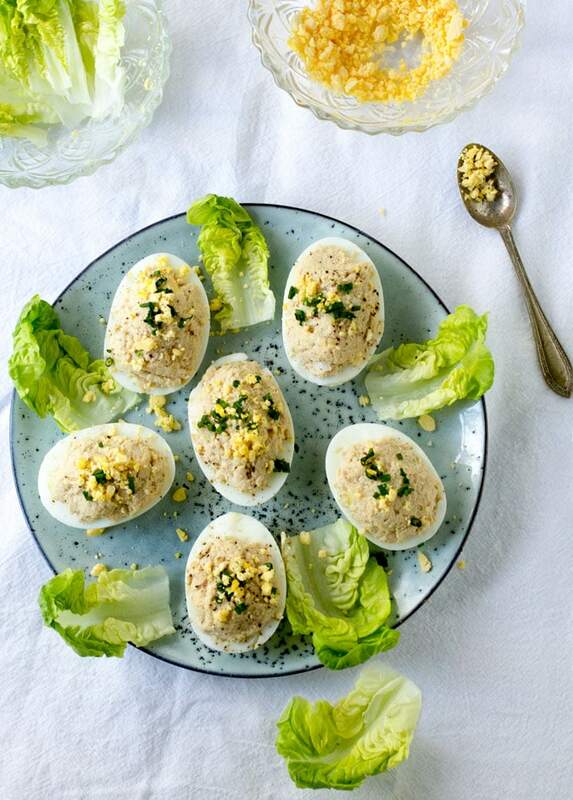 “Mimosa” refers to the garnish of yellow grated egg yolk sprinkled over the top of these deviled eggs with tuna. This bright yellow topping resembles the beloved yellow mimosa flowers that grow prolifically in the south of France and are celebrated in foods and festivals. But whether or not you’re reminded of mimosa flowers, bright yellow chopped egg is a terrific way to top this dish! I also love serving them for lunch, with a simple green salad or this light citrusy butter lettuce salad. And they are great for plain old snacking and even for breakfast. Peel and slice hard-boiled eggs in half lengthwise and remove the yolks. Finely chop half the yolks and reserve them as a topping. Mash the other half with a can of oil-packed tuna, a little mayo, mustard, a touch of vinegar and chopped scallions. Stuff the mixture into the egg-white shells and sprinkle with salt, pepper and chopped yolk. Add any other garnished you like, such as snipped chives, capers, sliced pimiento or chopped olives. If you’re excited to try this eggs mimosa recipe, the good new is you probably already have all the ingredients in house: a can of tuna, a half-dozen eggs, mayo, mustard, scallions (or any type of onion). It’s remarkable how easy it is to transform some eggs and a can of tuna into a fabulous French gourmet entrée. 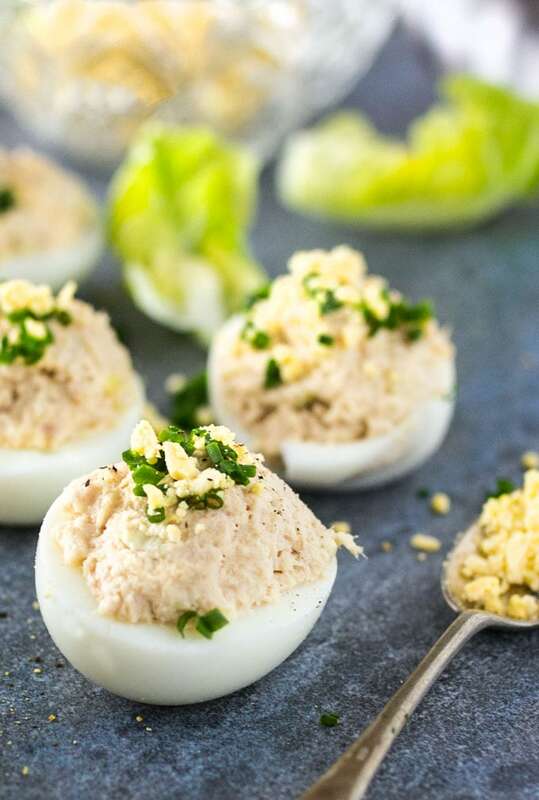 If you’re accustomed to deviled eggs with delicate piped-in egg yolk filling, you’ll notice that oeufs mimosa with tuna have a good deal more substance to them, yet they retain a fine and elegant quality, suitable for any occasion. Here’s the recipe for Eggs Mimosa with Tuna. If you try this recipe I hope you’ll come back to leave a comment and a star rating. I’d love to know what you think! 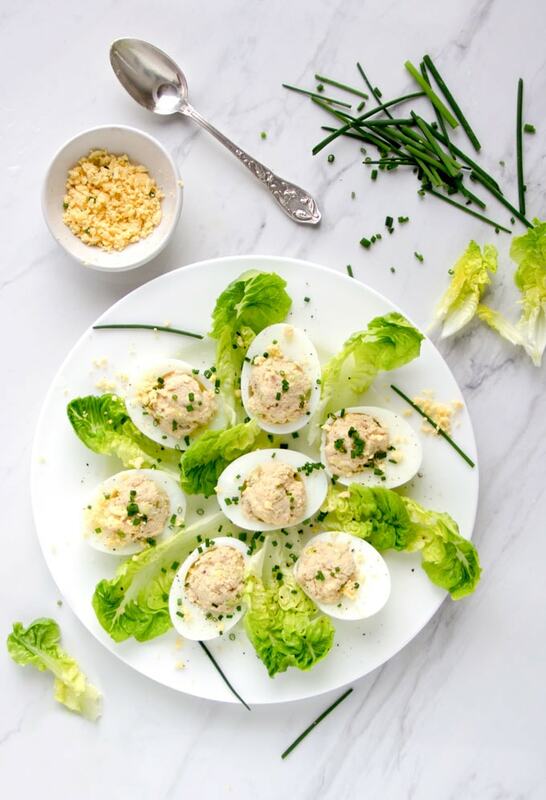 A perfect appetizer, lunch or game day treat, these French style deviled eggs are stuffed with delicious tuna and egg salad and sprinkled with finely chopped egg yolks for a bright mimosa-flower finishing touch. 1 7-ounce can of Italian tuna packed in olive oil, drained. 4–5 green onions, minced (about 4 tablespoons) or substitute an equal amount of red onion or shallot. Slice the eggs in half lengthwise with a sharp knife. Carefully remove the yolks. Try turning the egg so the yolk is facing down and give the white a gentle squeeze on either side of the yolk, and the yolk will hopefully pop right out. If not, use a spoon or a small knife to ease the yolk out. 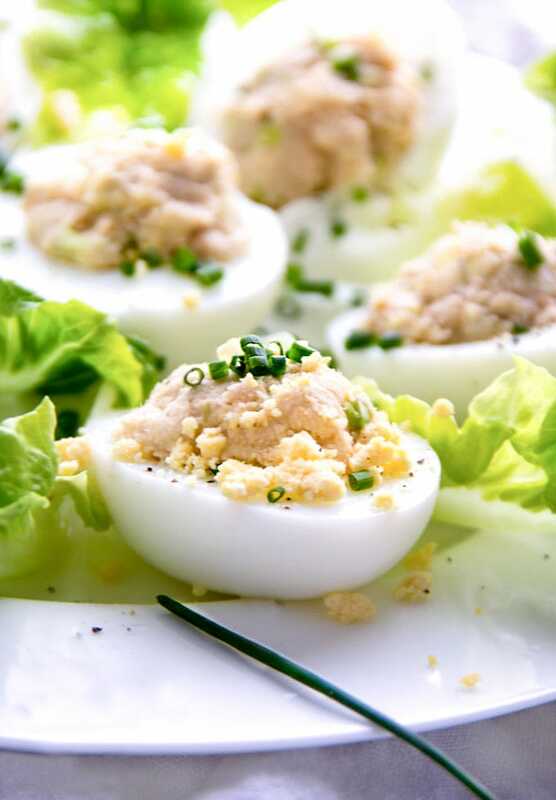 In a large bowl combine half the egg yolks with the tuna, mayo, mustard, vinegar, salt, pepper and green onions. Break up the tuna and mash everything together well until the mixture is the texture you desire. If you want it a bit more creamy, add a touch more mayo. Stuff The Egg Whites: Lay all dozen egg whites out on a tray or work surface. Stuff the egg whites generously with the filling. Just before serving, arrange the eggs mimosa on a platter. Season to taste with sea salt and pepper. Mimosa Topping: Finely chop the remaining yolks and sprinkle them over the stuffed eggs. Add garnishes of your choice. Make Ahead Notes: If you want to make the entire recipe ahead, I suggest you do it up to three hours before serving and keep the eggs mimosa covered in the fridge until about a half hour before serving. Hold off on the topping and garnishes until right before serving, for a fresh presentation.